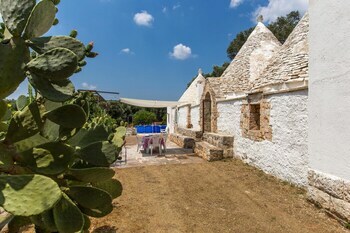 Located in Ceglie Messapica, Trullo delle Rimembranze is in a rural location, within a 10-minute drive of Emilio Notte Museum and Church of Santa Maria Assunta. Free self parking is available onsite. With a stay at La Casa dei Lumi in Longare, you'll be 9.6 mi (15.4 km) from Olympic Theatre and 9.9 mi (15.9 km) from Basilica Palladiana. Free self parking is available onsite. A stay at Palazzo Masi places you in the heart of Siena, steps from Piazza del Campo and Civic Museum. Featured amenities include express check-in, express check-out, and multilingual staff. With a stay at Agriturismo L'Aquila in Arbus, you'll be 6.2 mi (10 km) from Mineral Museum and 6.2 mi (10 km) from Montevecchio Mine. Free self parking is available onsite.